The Fluval Edge 6 gallon is a creative and unique fish tank from Hagen Fluval. 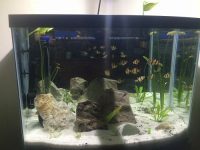 It is so great that many hobbyists want to have their own ones except that they have already kept many aquariums for years. 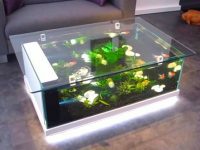 This review will outline the powerful features of the Fluval Edge aquarium to help you know if it is right for you or not. 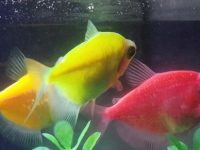 Besides, I also provide the methods to set up and maintain the tank as well as some stocking ideas in this article. Additives: Nutrafin Cycle and Nutrafin Aquaplus water treatment. 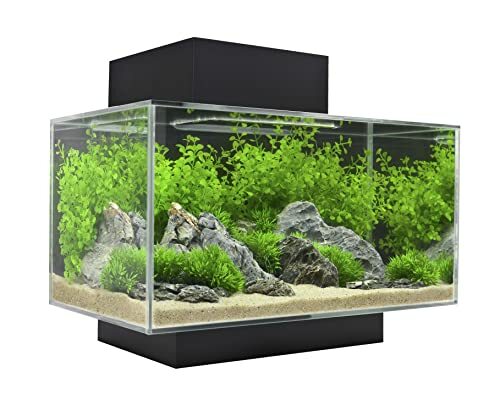 The Fluval Edge fish tank have sleek and modern design with glass on 6 sides that means you can enjoy your fish from all sides including the top. 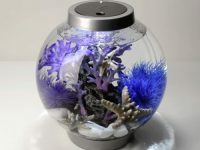 The unique design gives the tank a very contemporary look that is the reason why they are so attractive and popular in the aquarium hobby. When filled with full of water, the unique six sided glass design of the Fluval Edge aquarium allows for all-around viewing. If you position your tank at a level lower than your eyes you can enjoy the stunning effect of your fish from the above. The Fluval Edge aquarium sits on a base colored to match the rest of the hood and back panel. The back panel, which connects the base with the hood, hides equipment and unsightly wires. There are many colors for choice; however, the black base is easy to fit your home decor than the rest. 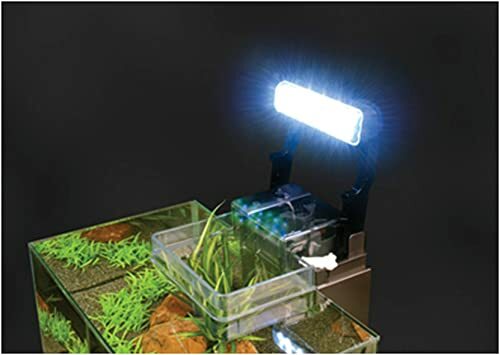 The LED light built under the lid includes powerful bright white LEDs 7600 K and deep blue night-time LEDs for daylight and nightlight. The lighting system is easy to control with a 3-position switch for bright daytime, deep blue nighttime and off modes. The very bright white daylight makes it ideal for setting up a planted aquarium with the tank. By combining with the gentle water flow created by the filtration system, the lighting creates a visually shimmering stunning lighting effect that enhances the beauty of the inside aquascape. The Fluval Edge 6 gallon aquarium comes with a power filter which is hung on the back of the tank. The back panel which connects the base and hood conceals the power filter from view. The filter is very powerful and quiet. 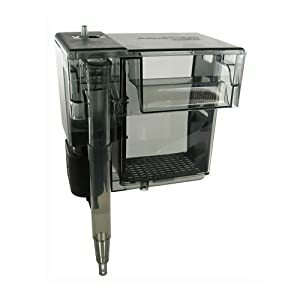 It filters the water through 3 stages to provide a clean and healthy environment for your fish and shrimps. The mechanical stage includes a foam filter which traps any particles and debris for manual removal. The chemical stage includes a carbon insert which absorbs impurities, odors, and any discoloration. 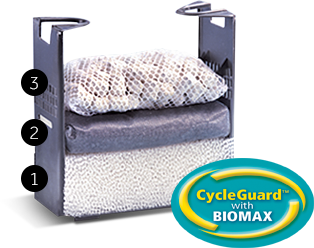 The biological stage includes a Biomax insert which encourages the growth of friendly bacteria to deal with nitrogenous toxins (ammonia and nitrite) degraded from organic compounds. Moreover, the filter creates a significant amount of surface agitation and movement to allow for proper gas exchange and provide an appropriate oxygen level for the fish. The filter operates so quiet that you can place the tank in any rooms from living room to bedroom. 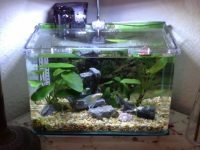 Most things needed to set up a freshwater tank are included and you only need to buy deficient ones. You will need a 25-watt aquarium heater for tropical fish, gravel and decorations for aquascaping. It is easy for you to assemble the tank follow the careful instruction from the manufacturer. Just a few steps, the stand snaps together and the glass tank just slides into the stand. Only takes a few minutes at most. You can easily access the inside space to set up and maintain the tank through its removable cover. 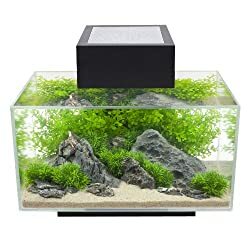 You can set up a tropical freshwater tank or planted tank as you want. During the early stage of your aquarium, you may encounter some problems with ammonia and nitrite, the Nutrafin Cycle helps eliminate these harmful compounds and prevent fish floss until the tank is cycled. The product also comes with the Nutrafin Aquaplus water treatment to make tap water safe for fish. The tank may be hard to clean without using some specific cleaning tools. 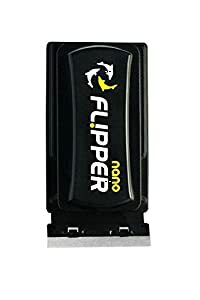 I recommend you to buy a nano magnet cleaner to clean the algae on the inside glass wall. 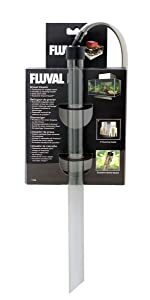 A Fluval Edge gravel cleaner with 13-inch intake tube, which is designed to reach any corner inside the tank, is also manufactured to help easily change the water of this special aquarium. 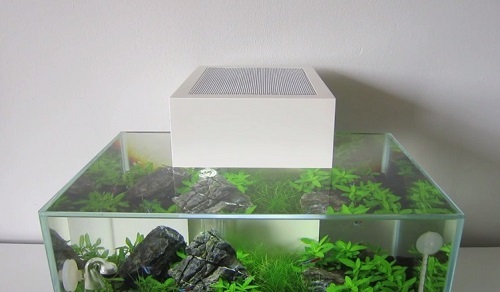 For feeding your fish, simply lift off the top cover to feed your fish. Removable cover for easy setup and maintenance. Not suitable for gulping air fish. The advantages clearly exceed the disadvantages. No aquarium is perfect and only you can decide on what’s right for you and your situation. The Fluval Edge aquarium is right up there in terms of being one of the best looking aquariums. 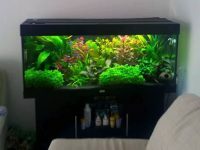 If the beauty of the tank is important to you then it’s an ideal choice. As the capacity of the aquarium is small you need to choose fish which are suitable for nano aquariums. Following are some ideal candidates. Species of fish like Betta and Gourami aren’t suitable for the Fluval Edge as they need to gulp air from the surface. The Edge’s top glass prevents them from being able to do that if the water level is full. With these fish and other fish that exhibit that behavior, the water level will need to be lowered a little. If choosing fish remember that they are normally introduced as young fish so you need to allow for growth. You should allocate a minimum of 1 gallon of water for every 1 inch of fish, excluding the tail. Tropical fish will require a heater suitable for the fish tank size. Although the tank can be used for freshwater or saltwater fish, it is more suited to freshwater fish due to its small size and may pose more of a challenge as a marine set up. It is better to start with a minimum 20 gallon aquarium for stocking saltwater fish to ensure the fish healthy. It’s even the best if starting with a 55 gallon aquarium tank in this case.